Now that you found this recipe, there is only one thing for you to do: run to the kitchen and start cooking this. Believe me, you won't be sorry. Rinse quinoa under running water and drain. Place in a saucepan with 1 cup of water and bring to boil over medium heat. Reduce the heat to the lowest setting, cover the saucepan and continue cooking for about 10 minutes. Turn off the heat, let the quinoa stand covered for about 5 minutes. Fluff with fork and cool completely. Add cooked quinoa, cucumber, tomato, red onion, capers, feta cheese, oregano, garlic, lemon juice and olive oil into a large salad bowl. Season with salt and pepper. Toss until combine and store in refrigerator while you're grilling the chicken. Wash the chicken breasts and pat dry with paper towel. Season both sides of chicken breast with ground cumin, salt and pepper. Cook the breasts on the grill, 5-7 minutes on each side, or until the center is no longer pink and the chicken is cooked through. Transfer the chicken breasts to a cutting board and slice. Place salad and chicken slices in individual plates and serve. Every item on the plate, at least from what you had here, looks good. The chicken would definitely be a winner. 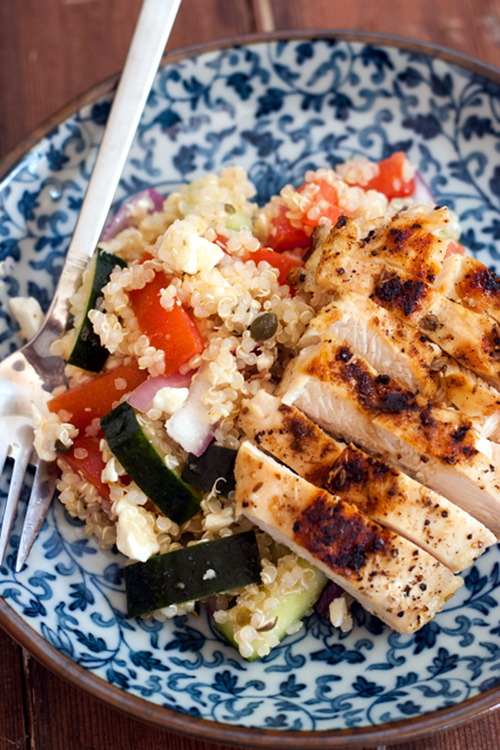 It looks good with all the quinoa. I think that the cucumbers and tomatoes are appetizing and will be excellent hot. Should be good spicy as well, although I know some people can't handle the spices. Have you tried pita bread with it? Pita bread with hummus is good so maybe it would be good with that salad. Pita bread & hummus? Not needed! 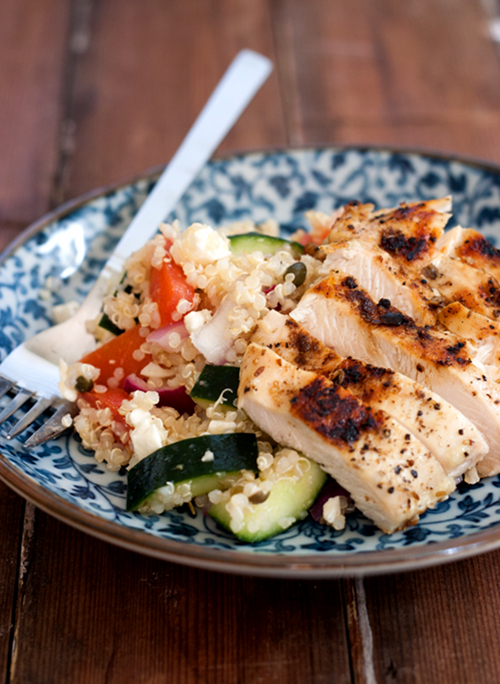 You get plenty of protein from both the chicken and quinoa, and the quinoa also replaces the need for carbs. Tried it...Loved it!...Blogged it. Thanks for a keeper! is this serving for 2 persons?